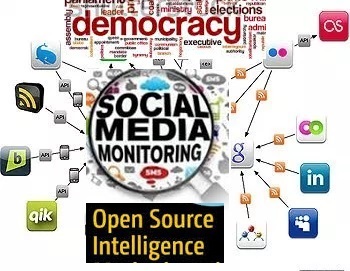 This essay is the second and concluding tranche of my piece titled, ''How The U.S, Facebook And Big Data Can Swing Nigeria’s 2019 Elections''. Read the Part 1 of the essay here if you are yet to. Guardian Newspaper reports that armed bandits, believed to be herdsmen yesterday, stormed a military camp in Doka community in Birni Gwari local government of Kaduna State where they opened fire on the soldiers who were sleeping, killing 11 in the process. 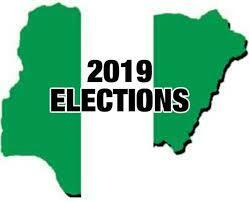 Introduction: Presidential and the National Assembly elections are slated to simultaneously hold across Nigeria on February 16, 2019 to elect the President, Senators and House of Representative members. The Presidency and the National Assembly are currently enmeshed in a cold war, due to the bent by the latter to override Buhari’s veto of the electoral Act Amendment Bill which among other things, propose to rejig the existing election sequence. The National Assembly members and the Presidency believe that the election sequence could make or mar their chances of reelection. With elections in the air, Nigeria is a beehive of behind-the-scenes political wheeling and dealing by politicians, political merchants and contractors, vested interests, and foreign governments. Gunmen on Sunday kidnapped an aged woman reported to be the mother of a communication giant and Chief Executive Officer of SLOT, Mr. Nnamdi Ezeigbo, at Ubakala, Umuahia south local government area of Abia state. The police in Borno on Thursday issued an alert warning residents of an impending attack by Boko Haram using vehicles loaded with Vehicle Borne Improvised Explosive Devices, VBIEDs. A former Chief of Naval Staff, Vice-Admiral Samuel Afolayan, has warned that the efforts of the federal and state governments to ensure national food sufficiency, employment generation, industrialisation and diversification of the economy may become fruitless if the menace of destruction of farmlands and attack on farmers by herdsmen is not curtailed. 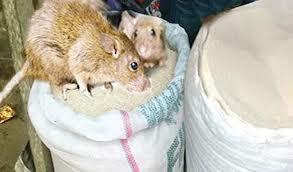 Some residents of Adamawa communities have raised the alarm over some undetonated bombs found in Shaforon, a community in Numan, saying they pose danger to the entire Numan communities. 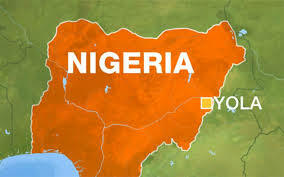 The alarm is coming barely three months after more than 75 people were allegedly killed in a Nigerian Air Force bombardment of the area. The Kingdom of Saudi Arabia has donated the sum of $10million to Nigeria to aid the nation’s fight against the Boko Haram insurgency. A suicide bomber with explosive devices strapped around his body on Monday night detonated himself at a crowded Muna-Datti area of Maiduguri, Borno State, killing three persons in the process. Now that it is a new normal for Daura Secret Service to stifle dissenting opinion, may I emphatically state that my appraisal of the Buhari administration and projection of his reelection prospect is not a function of vested interest. I don’t do ‘political party’ let alone parish-pump politics. I am simply a sycophancy-hating, disillusioned, politically-conscious, informed, straight-from-the-shoulder, passionate and active-citizen who desperately yearns for a safe society and a responsive, responsible, purposeful leadership. If you oppose with analysis, rather than resort to name-calling or intimidation, please do a rejoinder with superior argument. This is how it works in ‘’saner’’ climes. 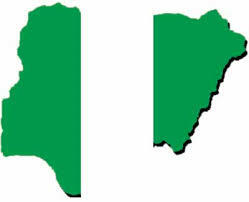 Having been around for a while, I say without mincing words that Nigeria has never witnessed the sheer level of despair, insecurity, bloodletting, audacious brigandage, instability, and excuses for non-performance like we have it now. A lot of people, yours sincerely inclusive, erroneously believed that Buhari been a retired Army General and ex Head of State, would rein in insecurity in the country. We were damn wrong! Nigeria is more unstable, less secure than it was five years ago. Jeffrey Smith, the Executive Director of Washington D.C-based Vanguard Africa Movement, submits in Pittsburgh Post Gazette, that ‘’Nigeria’s [Buhari] leader has exacerbated the country’s problems’’. According to Mr. Jeffrey, Mr. Buhari has exacerbated entrenched ethnic, social and religious fissures, leading to escalated violence across the country. The latest corruption perception index (CPI) released by Transparency International, TI, asserts that ‘’Corruption is getting worse in Nigeria’’. In a recently released report, the International Monetary Fund, IMF says Nigerians are getting poorer under Buhari’s government. Rather than be responsive and take responsibility, Buhari’s government effectively entrenched finger-pointing and buck-passing as national policies. Buhari tells Nigerians to pay the ultimate sacrifice for Nigeria but his disposition, lifestyle, that of members of his family and his kitchen cabinet profoundly negates his preachments. For instance, Mr. President’s son, Yusuf Buhari had a power bike accident in Abuja on Tuesday, December 26, 2017. After repeated denials that he was not flown abroad for medical treatment, the young man returned to Nigeria on March 1, 2018 after spending several weeks in Germany. Kogi state governor, Mr. Yahaya Bello, Minister of Interior, Abdulrahman Dambazau and his Health counterpart, Dr. Osagie Ehanire were amongst top Buhari appointees who abandoned their duties and trooped to the airport to welcome Buhari’s son. Make no mistakes; I sincerely don’t begrudge Yusuf Buhari. Thank God he recuperated; I only wish that president Buhari showed more empathy, expedites the homecoming of abducted Dapchi schoolgirls as he did his son. How many governors, ministers and bootlicking appointees spared time to not only empathize with families of abducted Dapchi schoolgirls but channel resources to ensure their safe, immediate return? What grounds will President Buhari, his handlers and ubiquitous spin doctors premise his re-election campaign on? 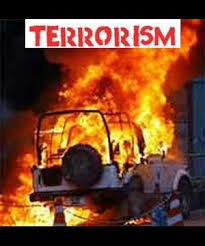 Tackling insecurity, Boko Haram? ‘Fighting corruption? I hear president Buhari bandying another campaign catchword - ‘’Next Level’’. 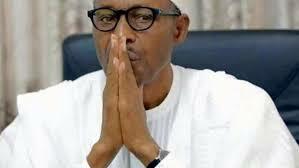 Is it the next level of the ‘’change’’ currently stifling Nigerians? Without further ado, this treatise aims to dissect how the under-listed shortcomings and events such as inter-alia: Boko Haram’s unrelenting attacks and recent abduction of 110 school girls from Dapchi, Buhari’s inaction and omerta over the marauding herdsmen bloodletting activities that permeates the nook and cranny of Nigeria, his manifest clannishness, nepotistic inclination, and skewed anti-corruption campaign, portrays the Buhari administration and will possibly jeopardize his reelection bid in 2019. The Chibok schoolgirls’ abduction seriously undermined Jonathan’s reelection in 2015. I foresee Buhari in tow. 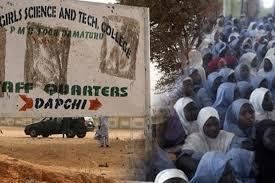 For a comprehensive report of the Dapchi schoolgirls abduction miasma, read my earlier piece – ‘’Analysis: The Dapchi Schoolgirls Abduction Debacle’’. Here, I opt to reconcile how this déjà vu, national shame will impact Buhari’s reelection prospect. President Buhari was in his home town – Daura, Katsina state when 110 schoolgirls of Government Girls Science and Technical College (GGSTC), Dapchi, Yobe State were abducted, purportedly by the Albarnawi faction of Boko Haram on Monday, February 19, 2018. Mr. President reportedly visited Daura to commiserate with bereaved members of his extended family. He was in Daura for five days. Buhari on Tuesday, February 20, departed Katsina State and flew to Yola, the Adamawa state capital to commission projects. Saturday, March 3, 2018, newly two weeks after the Dapchi schoolgirls abduction, akin to Rome's emperor Nero who reportedly “fiddled while Rome burned, Buhari, 22 state governors and several high-ranking members of his government flew to Kano to attend a wedding between the daughter of Kano State governor, Umar Ganduje and the son of his Oyo state capital, Abiola Ajumobi. Buhari couldn’t spare some time to visit Dapchi, Yobe state to sympathize with families of abducted Dapchi girls but he was fit as a fiddle, had all the time in the world to attend a wedding? Anybody with a conscience will agree that this is a gaffe; indefensible. Pretty sure he’s no lacking in Advisers or could it be that he is impervious to advice? I bet that Buhari would have swiftly visited Yobe if it had to do with politicking. I read somewhere that the Commander-in-chief of the armed forces of the federal republic of Nigeria didn't visit #Dapchi #Yobe because Boko Haram boasts of surface-to-air missiles (SAM), and Man-portable air-defense systems (MANPADS). Yet Boko Haram didn’t shoot down the Ministers, government delegates who visited Dapchi? In essence, #Dapchi, Yobe state is an ungoverned space in Nigeria? This spurious alibi is tantamount to demarketing Yobe state and Nigeria. Could it also be because of the threat of ground-to-air missiles (GAM) that the Commander-in-chief of the Armed forces of the federal republic of Nigeria is yet to visit Benue state as well? Hopefully these arsenals will not prevent the president and his party, the APC from visiting those climes to solicit for votes? As we speak, Buhari will on Monday, March 5, 2018, depart for Accra, Ghana to attend the country’s 61st independence anniversary scheduled for Tuesday. 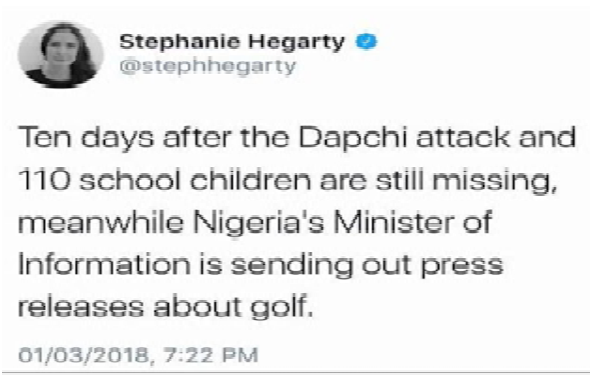 As if Buhari’s seeming nonchalance, lack of empathy is not enough, according to BBC journalist, Stephanie Hegarty, ‘’ten days after the Dapchi attack and 110 school children are still missing, Nigeria’s Minister of Information, Lai Mohammed is sending out press releases about golf’’. Lai Mohammed reportedly attended the 2018 West African Golf Tour which held in Abuja. Forget the flowery, cosmetic press releases; these people don’t care about poor Nigerians. Prior to the 2015 presidential election, Buhari vowed to 'lead from the front' against Boko Haram in the fight against Boko Haram if elected president. Five months into his presidency, Vanguard Newspaper, October 14, 2015 quoted Buhari as saying that, ''Boko Haram Insurgency will end by December''. December 2015 has come and gone and more than two years after his deadline, Boko Haram is still carrying out suicide attacks on hard, soft targets and also carrying out mass abductions. When it became evident that the December deadline was not pragmatic, Buhari told the British Broadcasting Corporation that, ''Nigeria has "technically won the war" against Islamist Boko Haram militants''. Aftermath of the Dapchi schoolgirls abduction, one of President Buhari's spin doctors, Mr. Femi Adesina, on February 25, 2018 came closer to the truth and admitted on Channels Television that, ''Boko Haram Terrorists have not been completely defeated but terribly Degraded'’. Of course that election took place in 2015 in Boko Haram strongholds, remotest parts of the northeast – Adamawa, Borno and Yobe attests to the fact that Boko Haram was substantially reined in before Buhari’s ascendancy. Hate him or love him, the former chief of army staff, General Azubuike Ihejirika stifled Boko Haram. Three years into Buhari’s four year presidency, Boko Haram seems to be emboldened by the millions of Euros ransom payments, the Islamic Sect purportedly received from the Buhari administration. In its May 19, 2017 report - ‘’The fate of the Chibok girls’’ - the British Broadcasting Corporation, BBC, broke the news that the Nigerian government paid two million Euros ransom to secure the release of 84 Chibok schoolgirls abducted by Boko Haram. Though the Nigerian government repeatedly denied this claim but in February 2018, some Nigerian Senators acknowledged that the release of some of the abducted Chibok girls involved payment of ransom to Boko Haram Terrorists. It was also reported that the Nigerian government paid millions of Euros to secure the release of some University of Maiduguri lecturers and ‘’policewomen’’ abducted by Boko Haram. 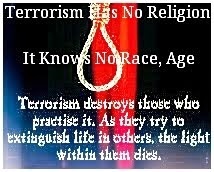 The problem with this ransom strategy is twofold: (a) it becomes a money-spinning enterprise for corrupt government officials who negotiate for ransom payments, release of victims (b) it becomes a vicious cycle, terrorists are emboldened and ransom goes funding, equipping the terrorists. Propped by ransom war-chest, it is not surprising that Boko Haram that seemed to peter out, is now reinvigorated, now launching blistering attacks in northeast Nigeria. Apart from the Dapchi schoolgirls abduction, in a spate of one week, Nigerian Army Commanding Officer, Lt. Colonel AE Mamudu was felled in Sambisa forest reportedly by a vehicle-borne Improvised Explosive Device (VBIED), three United Nations aid workers, three soldiers were reportedly killed by Boko Haram on Thursday, March 1, 2018, when the bloodletting Islamic Sect attacked the Rann Internally Displaced Persons, IDPs camp, situated at Kala-Balge Local Government Area of Borno State. It is evident that Buhari has failed in his promise to lead from the front and to end the Boko Haram insurgency within three months. 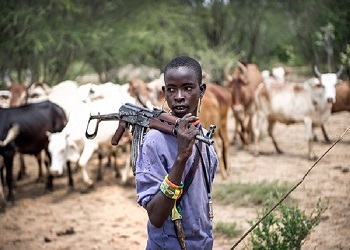 Fear and anxiety continue to pervade the nook and cranny of – Taraba, Kaduna, Benue, Plateau, Zamfara, Ekiti, Ondo, Oyo, Ogun, Enugu states and other parts of Nigeria over sporadic, bloodletting attacks by so-called herdsmen. 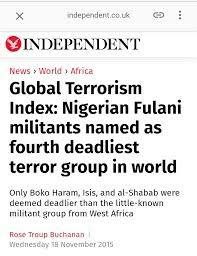 Recall that the Global Terrorism consistently ranked Fulani Herdsmen as the fourth deadliest terrorist group in the world. Apparently, Buhari a Fulani himself refuses to see things this way. It smacks of double standard that Buhari came very hard on Shiites, Biafra activists - the Indigenous People of Biafra (IPOB) but is not decisive on the herdsmen imbroglio. 73 bodies of victims of herdsmen attack in Benue state were buried weeks ago. In a chat with BBC Pidgin, a leader of Miyetti Allah cattle breeders in Benue State, Garus Gololo revealed that Fulani herdsmen attacked some communities in Benue state, saying their action was a reprisal for alleged theft of cows. In his words, “as we dey relocate go Taraba State through Nassarawa State, for border town of Nengere, thief come collect 1000 cows from us, so we sef fight dem back”, he said. Notwithstanding the bloodletting in Benue state, President Buhari is yet to visit Benue state nearly three months after the attack. The political implication of Buhari’s inaction and nonchalance over marauding herdsmen attacks in Benue and in the middle belt is that Benue state governor and some of his colleagues are tenably on their way out of the APC. My prognosis is that the electoral fortune of the APC/Buhari in Benue state and in the middle belt in 2019 is bleak. The Nigerian military suffered a massive setback in the war against terrorism as Boko Haram terrorists sprung a surprise attack on Rann reportedly killing at least a dozen people and injuring several others.